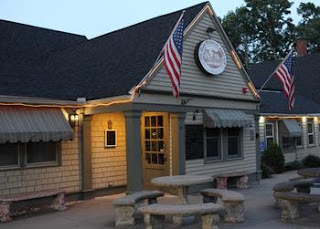 In this Kitchen Nightmares episode, Chef Gordon Ramsay visits the historic Olde Hitching Post, in Hanson, Massachusetts, purchased by Greek restaurateur Tom Kessaris. Although he bought the restaurant for his daughter, he runs the restaurant and does not let Andrea have her say. Tom is supporting the restaurant with his own savings, Andrea says that she wouldn't have signed up to it if she knew 7 years later she still would not be in control. Tom says she is not ready, she isn't hungry for it and isn't hard working. Tom tells him that he buys quality food but he is losing $7-8,000 a week. Gordon finds out that Andrea's husband has been bought in to help in the kitchen. Gordon sits down to order some food and meets server Carla, she recommends the Cranberry Haddock, he also orders the meatloaf and lobster ravioli. The ravioli are cold in the middle, the cranberry haddock is watery, bland and under cooked. The grilled meatloaf is disgusting, dry and the Chef doesn't know when it was made. Gordon witnesses a dinner service and he sees a lot of frozen food being used. Gordon dares Tom to take the frozen food into the restaurant but he would be humiliated to make a scene. Gordon tells the servers to tell the customers what food is fresh and frozen and the customers aren't happy. The next day Gordon visits the local radio station unconvinced that the locals love the food they serve. Customers complaints range from stomach problems to the dated nature of the restaurant. Gordon returns to the restaurant to pass on the comments, Tom promises to change and visits two local customers to demonstrate that you can make fresh meatloaf. Gordon's team redecorate the restaurant and the dated cranberry decor and booths are gone. Gordon has also revamped the menu, everything is to be made fresh, new dishes include a clam chowder, a New England Lobster roll and an improved fresh meatloaf. The staff sample the menu and love the food. On relaunch night, the restaurant is packed with Andrea running the kitchen and Tom is hovering around in the background. Gordon inspects a salmon dish, it is raw in the middle and he reminds Andrea to insect the food carefully and for the chefs to slow down. The customers love the food and Andrea does a great job. Tom is complimenting his daughter and supporting her. After the relaunch, Tom asks Andrea to sit down for a chat and he finally agrees to pass the restaurant on. In the following weeks, Tom leaves Andrea to run the restaurant as promised and the locals are happy with the new menu and new restaurant. After Gordons visit Yelp reviews and Trip Advisor reviews are mixed, more recent reviews are mostly positive. It appears that Andrea is now owner/manager of the restaurant. Planning a visit to the restaurant? Check out their website for more info including opening hours. Olde Hitching Post was aired on January 25 2013, the episode was filmed in June 2012 and is Kitchen Nightmares season 6 episode 6.
dont rout her. root for her. 1. a disorderly retreat of defeated troops. "the retreat degenerated into a rout"
"the party lost more than half their seats in the rout"
Is an australian, and I can say that there is a world of difference between "Rooting FOR her", and "rooting her". Tom: "Yes, I'm cooking it, and I'm freezing it. There's nothing wrong with that!" From watching Kitchen Nightmares (both UK and US versions) and Restaurant:Impossible, I'm very convinced that there is a huge difference in food quality expectations between older and younger generations. Frankly, people somewhere in their 60s and over seem to have lower standards and expectations of food quality than younger adults. Other episodes that show good examples of this differing standards are The Priory (UK), Fleming, Seascape, and Wagon Wheel (from Restaurant:Impossible). Even with below-par food, these restaurants had no problem retaining diners who began eating there years ago, but could not appeal to a new generation of younger diners. I suppose this is one reason why a restaurant's popularity peaks, then dies down over time. Places that have that regular, older clientele should have a seniors menu to hand them. But, definitely they need to improve their standards across the board. There is just no excuse for serving crap, even if it is a tired old classic dish that only the blue hairs still order. 1. The younger generation have availability of food that the older generation never had. The younger generation has the world of food on their door step, something the older generation didn't have. 2. The older generation have had to do without so they are more willing to eat sub par food because in their childhood it was either eat nothing or eat something that's not so great. As for the older generation having lower standards - let's not forget that the younger generation enjoy eating fast food like McDonald's, KFC etc, which is not exactly of a high standard. And, let's not forget the countless of younger chefs on this show who serve absolute garbage. In fact, the younger chefs and restauranteurs on this show far outnumber the older chefs and restauranteurs. ^ A wise observation anon! One thing that drives me crazy about this episode is that the voice-over narrator (who is also the Executive Producer, Kent Weed) calls the restaurant "The Olde Hitching HOUSE" not once, but twice!! The article says,"There are new owners as of sometime during late 2015/ early 2016". Makes me think no. I got on here wondering the same thing.